Apple's next free iOS 7 update is expected to fix bugs and enhance a variety of user interface elements, but fresh rumors claim the release —supposedly coming in mid-March —will also include a major overhaul of the Mobile Device Management mass deployment system and will launch alongside a totally new "Volume Services" Web client. An unverified source reported to AppleInsider that Apple is working with a select few MDM vendors and institutional clients on efforts to improve iOS managed deployment, and that those improvements are currently set to ship as part of iOS 7.1 "around March 15." While only a vague date was offered in regard to the release, the person did provide concrete information on Apple's mass device deployment initiative, including new never-before-seen features. 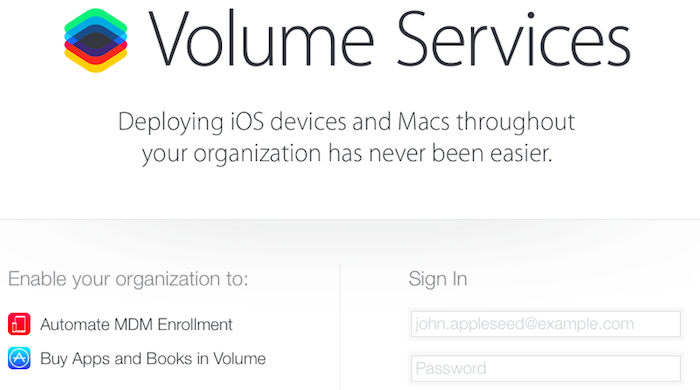 For one, Apple now has a live Volume Services website active for client login. With a 2014 copyright date, the site is said to still be in testing, but will launch with new features like the ability to "Automate MDM Enrollment" and "Buy Apps and Books in Volume." A departure from the current Configurator tool, the website hints at the development of powerful backend assets that go beyond current MDM server capabilities. The source said these new tools will likely see release with the upcoming iOS 7.1 update. A tentpole feature for the new MDM system will be over-the-air supervision of deployed iOS devices, which will allow institutions to easily monitor and protect large iOS device deployments, the person said. For example, a school administrator would be able to set and lock device profiles, data and other information without risking deletion by the student. Further, the new OTA method will bypass Apple's Configurator app, which some administrators have criticized for its lack of powerful security tools. Configurator provides basic profile and managed configuration features, but is intended to be used by smaller organizations, not the typical enterprise or large education sector which Apple is now targeting. Similar to parental controls, MDM allows education, government and corporate organizations to centrally and securely configure fleets of mobile devices, including the installation of custom apps, setup profiles that grant access to the organizations' networks, and the enforcement of administrator designated restrictions such as turning off camera hardware or blocking access to websites or other app installations. 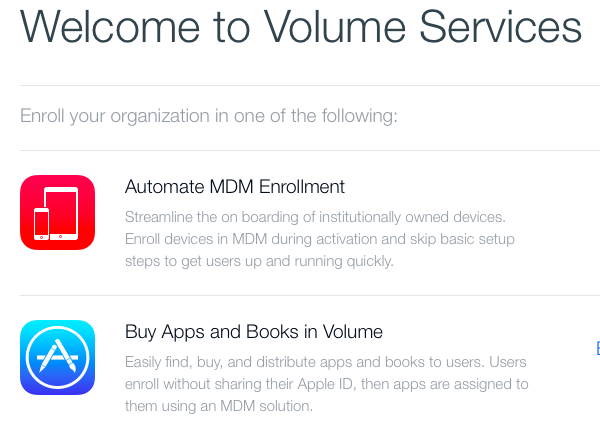 Improved Managed Deployment options are said to protect MDM-instituted profiles, a feature that would have come in handy with iPads deployed by the Los Angeles Unified School District as part of its technology in education initiative. Apple's Configurator was at least party to blame when students successfully bypassed the restrictions installed by administrators seeking to prevent them from accessing off-limits sites like Facebook and YouTube. Apple shipped a first beta of iOS 7.1 to its registered developers several weeks after the public release of iOS 7 in September. That was followed by a second beta in December, which included fixes for iTunes Match and a settings tweak for Touch ID. A third beta release in early January included fixes for iCloud account setup and audiobook playback. A fourth beta in late January targeted a 'send failure' issues with iMessage, while a fifth beta added new "natural sounding" voices for Siri in Australian and British English, Japanese and Mandarin Chinese, as well as user interface enhancements. 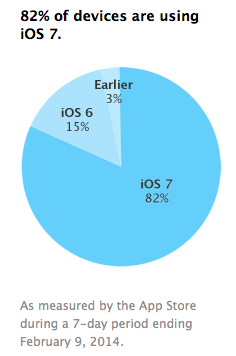 Less than five months after Apple released iOS 7, the company now notes on its developer website that 82 percent of App Store users have upgraded, with just 15 percent remaining on iOS 6. The original 2010 iPad and smartphones prior to iPhone 4 can't upgrade. No other mobile platform vendor regularly delivers anything similar to Apple's free iOS updates to their users around the world, supporting hardware as much as three years old, and none can claim a similar installed base of tens of millions of users on the latest release of their software. Editor's Note: An earlier version of this story erroneously stated that a release of iOS 7.1 was slated for March 15th instead of 'around March 15th' or mid-March. The error has since been corrected.